It is coming up to its 160th year and, as we start 2019, Emily Ashworth catches up with the new chief executive of the Royal Agricultural Benevolent Institute, Alicia Chivers. It is an organisation that was started by a farmer and continues to help farmers and those from rural communities to this day. Since 1860, when Essex farmer John Mechi founded the Royal Agricultural Benevolent Institution (RABI), the charity has cemented itself as a trusted pillar of support to our industry, from the very first donation, made up of 1,700gns, to the £2.2 million given out to those in need across England and Wales during 2018. John, led by the concern of mass poverty in the farming community, wrote to The Times to gather support and was overcome with replies and pledges from those prepared to donate annually. 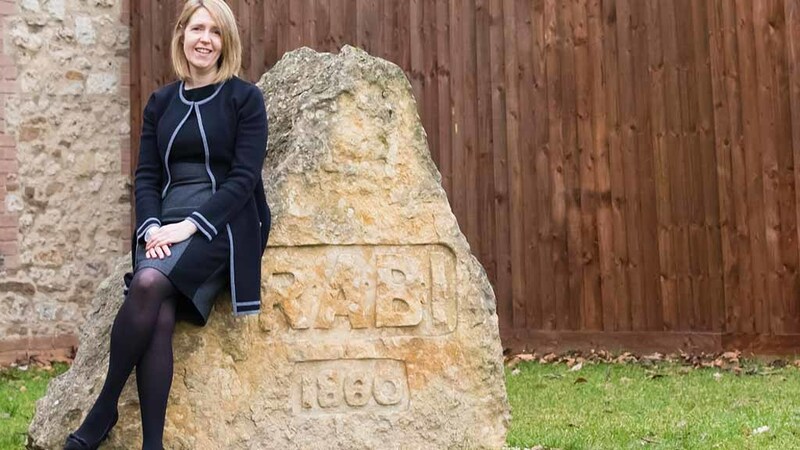 Last year saw Alicia Chivers begin her new role as chief executive of the renowned charity and it is with a passion for seeing people thrive from the help given that she will take RABI into a new year. After her father left farming to join the Royal Air Force (RAF) during the war, and with her uncle still running the family arable farm near Newbury, Alicia has been fortunate, she says, to enjoy a former career running the RAF Central fund (RAFCF). Now, she can turn her hand to supporting the farming community, both equally important elements in her own family history. While being able to utilise skills gained from six years with the RAFCF, the choice to take up the position with RABI was fuelled by the desire to instigate positive change in a time of uncertainty for many. And it was an opportunity to go back to her roots. “These are my people, if you will,” says Alicia. “But there are a lot of similarities between the military and farming. “The RAF was trained to be self-reliant and robust; farmers were brought up to be self-reliant and robust. It isn’t easy to ask for help. Alicia is keen for people to see beneath the surface of what RABI does aside from giving out money, championing the network of people, case workers and beneficiaries integral to each and every cause they work on. She says: “Be it from dealing with mental health within the community or helping people fill out forms online, being able to tell you the facts and figures is helpful, but it’s actually about someone being there that takes the tension away and diffuses a situation when you’re dealing with the benefits system, for example. “It’s daunting and scary, but having someone with you really helps. Although you can perhaps try and safeguard your farming business financially, the fact of the matter is sometimes you cannot prepare for the unexpected death of a loved one. After losing her husband Norman, Debbie Billen along with son James and daughter Janet, were left with the responsibility of running their 97-hectare (240-acre) dairy farm in Dorset. Following a routine operation on his knee, it was discovered that Norman suffered from a hereditary condition that made him susceptible to blood clots. Tragically, he developed a clot and passed away suddenly. Yet the prospect of running the farm full-time between them wasn’t Debbie’s only worry, as she watched her son desperately trying to cope with the grief of losing his father while dealing with the enormity of now being in charge. Debbie contacted RABI and imminently received business advice and support from one of the charity’s welfare officers, along with a £2,000 grant to put towards hiring some extra help. She says: “It wasn’t just about having someone to help with the work either. Recalling a recent individual she visited, Alicia values the simple effect of social interaction. She says: “The last case I went to was a retired farm worker in his 50s, who has Parkinson’s disease. “He is in a remote area and, to an extent, is struggling. He had received letters which he thought were asking for money from the housing association, but that wasn’t the case. “With support, we were trying to help him move into a 24-hour supported housing association, closer to his family. Alicia is adamant that taking a step back and getting out to visit people who benefit from the charity’s work is key to putting it all into perspective. She says: “It’s the highlight of the job and I think it is so important that everybody gets to go out with case workers. We live in a society too, says Alicia, that was brought up on the ethos that if there is a problem, deal with it and even if you can’t, get on with it anyway. Although life can throw any one of us a curveball, our industry can be dealt blows overnight; ones which can cause devastating situations to arise in a short space of time. Alicia says: “I’m lucky to have come in at a fantastic time and, although we are secure at the moment, we know that the next 10 years could be tough. But we can’t stick our heads in the sand. Looking ahead, the charity will continue to support people within the rural community at their greatest time of need, but Alicia wants to reach even further out into society and break down those somewhat proud barriers that can stop people asking for initial help. Alicia says: “This is about support and it’s not about you thinking you’re failing or needy. How can we spread the word and how can we make it as easy as possible for people to know that it is okay to come to us? For Alicia, to work in a part of society that still values a ‘love thy neighbour’ attitude is refreshing, and the charity will persist in honouring its founding cause. She says: “In formal terms, people still have a duty of care in the farming community which has disappeared a lot more from other elements of our society. “The core for us now is to make sure we are prepared for what may challenge our community and to feel secure that everybody who needs back-up knows it’s there.